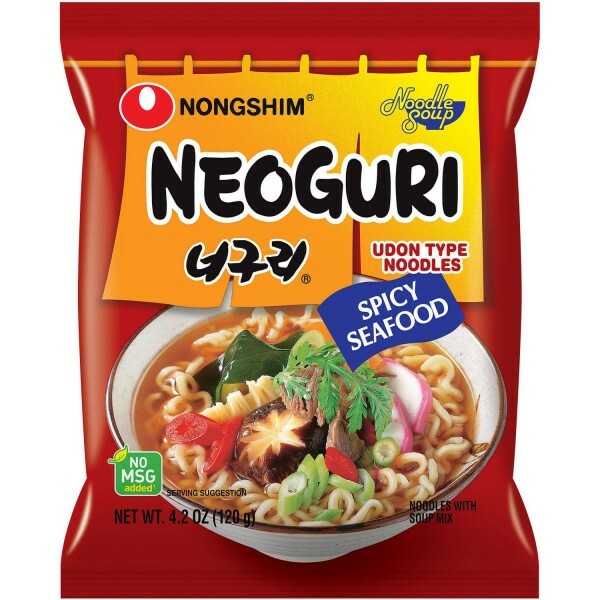 Nongshims Neoguri made its debut in 1982 and gained popularity for its thick Udon-style noodles and distinct spicy seafood flavor. Many years have passed since then, but Neoguri continues to be made with real seafood ingredients, and remains one of the most popular of Nongshim products. 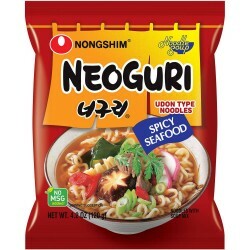 Noodles: Wheat Flour (Australia), Potato Starch, Palm Oil, Seasoning (Rice Bran, Oil, Sugar, Cuttlefish, Anchovy, Emulsifier (E322) (Contains Soy), Shrimp, Fish Sauce (Tuna, Sea Bream)), Salt, Tocopherol Liquid (Antioxidant (E306)), Emulsifier (E322 (Contains Soy)), Acidity Regulators (E501, E339, E500), Green Tea Extract (Oligosaccharides, Tea Catechin, Acid (E330)), Colour (E101). Soup Powder: Seasoning (Maltodextrin, Hydrolysed Vegetable Protein (Soy, Wheat), Salt, Yeast Extract, Mussel, Sugar, Cuttlefish, Clam, Anchovy, Tuna, Crab, Shrimp, Bonito), Salt, Spices (Maltodextrin, Chilli Pepper, Black Pepper, Garlic), Sugar, Flavour Enhancers (E631, E627), Caramel Powder (Maltodextrin, Colour (E150c)), Anti-caking Agent (E551). Flakes: Kelp, Seaweed, Green Onion, Carrot, Fish Cake (Pollack, Cuttlefish, Wheat Starch).